Hi WM crew hope all is well. I added a Kole Tang to my 72g Bow Front a couple of days ago. Tank parameters Salinity 1.025, PH 8.2 early morning tests before the lights come on, Ammonia 0, Nitrites 0 and Nitrates 0(undetectable) on a Salifert test kit. 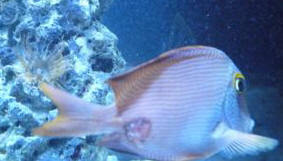 Tank occupants 4 Red leg Hermits, 4 Green Chromis, two Cleaner Shrimp. Tank was down for a couple of years and I restarted when I moved to north Texas from California around July of 2016. The recently added Kole tang has what appears to be a wound on his side. He has been very skittish as expected since I added him to the tank a couple of days ago. Today he was out more but I noticed that he has what appears to be a wound or parasites? We had a severe storm and lost power for over 12 hours the night he was added. He goes at the live rock constantly(eating) when out and about and ate the New Life Spectrum Thera A+ soaked in garlic that I fed when I got home this evening. Had to take the photo from a distance as he's still skittish. What do you think? Should I leave in the tank and just keep parameters optimal? I do have a hospital tank I could use. Should I treat somehow? Wanted to thank you for your response and also send an update, the injury healed amazingly quickly, I was very surprised. New pic with a quick question there are a couple of bumps just behind his eye on the same side as the original injury.. He's much less skittish.. Do you think these are also injuries from bums in the night/day? Water parameters still measure the same.. I bought a Kole tang three days ago and have got him in QT. In the first few days he was attacking his reflection along the back glass and I fear he may have caused some damage to his mouth. I have covered the glass and his behaviour has improved. He is nibbling at food but I haven't seen him take any yet. I have also added Nori to the tank but haven't seen him eat this. Is there anything I need to be concerned about at this stage or should I just observe him and try some different foods such as frozen Mysis or the like. I do plan to hypo him as a precaution against marine ich. Thanks again for all your help and information to hobbyist such as myself. reduction in swelling. How resilient are Kole Tangs. I was hoping to hypo the Kole but maybe I need to move him in with some live rock on his own and see how the goes there. I have some live rock I have QT'ed for the last 5 weeks for my DT so I can move some of this and leave a piece or two for him to feed off and hide amongst. He still seems very shy. really feel responsible when it comes to keeping fish healthy and alive. I have had this Kole for a bit over six months now and he has been awesome. Eating every type of food I offer (Mysis, Formula One, and Formula Two). Today I noticed this really bizarre spike or bone sticking out from its caudal peduncle region, right before the caudal fin. It protrudes out about 1/2 a centimetre on both sides as if the fish has been punctured through. or any type of puss seeping. In fact, it appears as if this is causing the fish no harm at all. He ate like a hound dog this morning. I have taken a few pictures and they are jpegs attached in .zip form. What could this possibly be? <This is clearly seen in these photos. Ever wondered why these are called 'Surgeon Fish'? This is the 'scalpel' that all Surgeons have, and is one of the identifiers that help place each species into a genus. 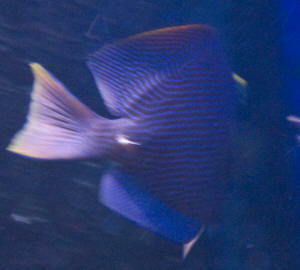 This Ctenochaetus species has a single retractable scalpel on each side of the caudal peduncle. 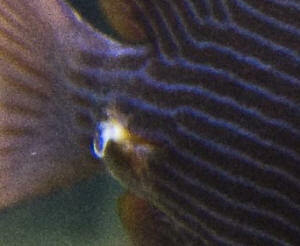 For some reason this fish has it's scalpel in 'out' mode. Why? Maybe as a defence/ offence showing to another fish in the system>. , and an assortment of shrimp, crabs and snails. I appreciate the response. It makes sense because he always seems to be going after the Blenny and he's a pretty big Blenny. I am assuming this is because they share a natural food source? Although, I have <read?> a lot about the Kole and they are mainly detritivores? Hi guys. 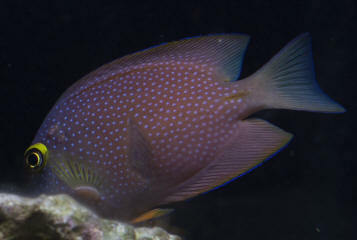 I got a Yellow Eye Kole Tang yesterday, and it had a couple spots on its right side that were very close to its body color, so I thought they might be some sort of scarring from being bitten from another fish. Now, a couple of the spots have changed from near-body color to a whitish color. The spots are about 1/16th to 1/8th of an inch across, and the whiter ones are slightly raised from the rest of the skin. 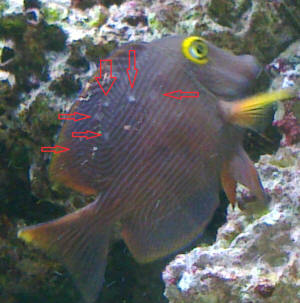 He's hard to take a picture of because he hides, so I used arrows to indicate the spots that weren't from the tank glass. The rightmost spot is what they all looked like when I first saw the spots. There aren't any more of them that have appeared since I got him, just changing in color. Is this ich, or some other infection? on the part of the tang, but it was never too serious (mostly just chasing the wrasse away from his hole). 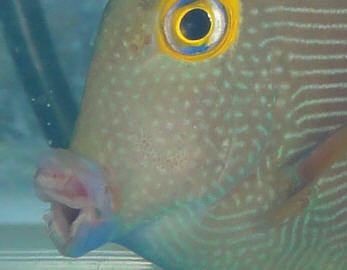 About a day after the wrasse was added, there was a small "scratch" between the tangs eyes. It wasn't red, and didn't seem irritated. It seemed like the scales had been scratched off. I didn't put much thought into it because he certainly was acting normal and it healed up within just a few days. 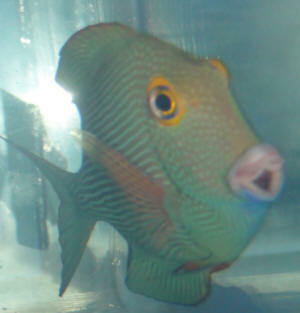 However, two days ago, I added a one spot Foxface to the tank. 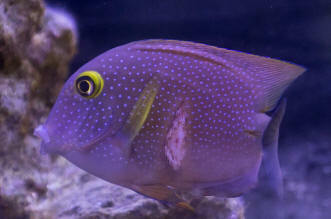 The tang largely left this fellow alone, and everything has been going grand. That being said, last night, not 10 minutes after doing some work in/on the tank, I came back to the room to find another similar spot on the tang's face. This time it was larger, and more on his snout, but it looked like the same kind of "injury." Is this attributable to him picking on the new fish and the new fish fighting back? A new fish seems like the common denominator here, but it could just be a coincidence. I do have a skunk cleaner. Could the shrimp have gotten a little too overzealous? The only other thing I can think of is that he stuck his face up into one of the Koralia pumps (though that doesn't seem likely to me). I'd think his injuries would be much more severe had he done that. Any input would be greatly appreciated. He seems to be none worse for the wear, but I'd love to hear what you have to say. Thanks for the reply. This is a 75 gallon tank. I thought you might say that! All inhabitants are quite small at the moment...less than 3 inches.